"The Few, The Proud, The Marines", "Jarheads", "Devil Dogs", "Teufel Hünden", "Leathernecks"
Gen John M. Paxton, Jr. The United States Marine Corps (USMC) is a branch of the United States Armed Forces, responsible for providing power projection from the sea, using the mobility of the United States Navy to rapidly deliver combined-arms task forces. The U.S. Marine Corps is one of the four branches in the U.S. Department of Defense as a member of the Joint Chiefs of Staff. It is one of the seven uniformed services of the United States. The Marine Corps has been a component of the naval forces for training, transportation, and logistics. 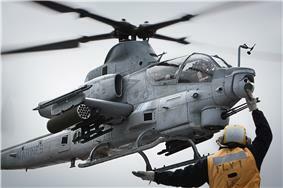 The USMC operates posts on land and aboard sea-going amphibious warfare ships around the world, and several of the Marines' tactical aviation squadrons, primarily Marine Fighter Attack squadrons, are also embedded in Navy carrier air wings and operate from the Navy's nuclear-powered aircraft carriers. Two battalions of Continental Marines were formed on 10 November 1775 in Philadelphia as an infantry force capable of fighting for independence both at sea and on shore. The role of the Corps has since grown and evolved, expanding to aerial warfare and earning popular titles such as "America's third air force" and "second land army". The United States Marine Corps has distinguished itself as it has served in the majority of American wars, from its inception to the modern era, and attained prominence in the 20th century when its theories and practices of amphibious warfare proved prescient and ultimately formed the cornerstone of the Pacific theater of World War II. By the mid-20th century, the U.S. Marine Corps had become a major theorist and the dominant practitioner of amphibious warfare. Its ability to rapidly respond on short notice to expeditionary crises gives it a strong role in the implementation and execution of American foreign policy. 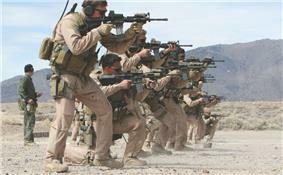 The USMC has around 194,000 active duty members and just under 40,000 reserve Marines as of 2010. It is the smallest of the U.S. Armed Forces within the U.S. Department of Defense. This last clause, while seemingly redundant given the President's position as of 1798. In 1951, the House of Representatives' Armed Services Committee called the clause "one of the most important statutory – and traditional – functions of the Marine Corps." It noted that the corps has more often than not performed actions of a non-naval nature, including its famous actions in Tripoli, the War of 1812, Chapultepec, and numerous counter-insurgency and occupational duties (such as those in Central America), World War I, and the Korean War. While these actions are not accurately described as support of naval campaigns nor as amphibious warfare, their common thread is that they are of an expeditionary nature, using the mobility of the Navy to provide timely intervention in foreign affairs on behalf of American interests. In addition to its primary duties, the Marine Corps has missions in direct support of the White House and the State Department. The Marine Band, dubbed the "President's Own" by Thomas Jefferson, provides music for state functions at the White House. Marines from Ceremonial Companies A & B, quartered in Marine Barracks, Washington, D.C., guard presidential retreats, including Camp David, and the Marines of the Executive Flight Detachment of HMX-1 provide helicopter transport to the President and Vice President, with the call signs "Marine One" and "Marine Two", respectively. By authority of the 1946 Foreign Service Act, the Marine Security Guards of the Marine Embassy Security Command provide security for American embassies, legations, and consulates at more than 140 posts worldwide. Throughout the late 19th and 20th centuries, Marine detachments served aboard Navy cruisers, battleships and carriers. Marine detachments (generally one platoon per cruiser, a company for battleships or carriers) served their traditional duties as ship's landing force, manning the ship's weapons and providing shipboard security. Marine detachments were augmented by members of the ship's company for landing parties, such as in the First Sumatran Expedition of 1832, and continuing in the Caribbean and Mexican campaigns of the early 20th centuries. Marines would develop tactics and techniques of amphibious assault on defended coastlines in time for use in World War II. During World War II, Marines continued to serve on capital ships. They often were assigned to man anti-aircraft batteries. When gun cruisers were retired by the 1960s, the remaining Marine detachments were only seen on battleships and carriers. Its original mission of providing shipboard security finally ended in the 1990s as the battleships were retired and nuclear weapons were withdrawn from deployment on aircraft carriers. While the Marine Corps does not employ any unique combat arms, as a force it can rapidly deploy a combined-arms task force to almost anywhere in the world within days. The basic structure for all deployed units is a Marine Air-Ground Task Force (MAGTF) that integrates a ground combat element, an aviation combat element and a logistics combat element under a common command element. While the creation of joint commands under the Goldwater–Nichols Act has improved inter-service coordination between each branch, the Corps' ability to permanently maintain integrated multi-element task forces under a single command provides a smoother implementation of combined-arms warfare principles. This focus on the infantry is matched with the doctrine of "Every Marine [is] a rifleman", a focus of Commandant commander's intent" as a guiding principle for carrying out orders; specifying the end state but leaving open the method of execution. The amphibious assault techniques developed for World War II evolved, with the addition of air assault and maneuver warfare doctrine, into the current "Operational Maneuver from the Sea" doctrine of power projection from the seas. The Marines are credited with the development of helicopter insertion doctrine and were the earliest in the American military to widely adopt maneuver-warfare principles which emphasize low-level initiative and flexible execution. In light of recent warfare that has strayed from the Corps' traditional missions, it has renewed an emphasis on amphibious capabilities. 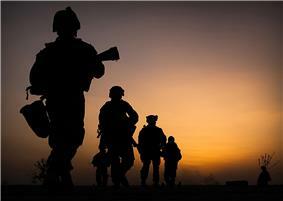 Marines conduct a patrol in Iraq. The Marine Corps relies on the Navy for sealift to provide its rapid deployment capabilities. In addition to basing a third of the Fleet Marine Force in Japan, Marine Expeditionary Units (MEU) are typically stationed at sea. This allows the ability to function as first responders to international incidents. The United States Army maintains light infantry units capable of rapid worldwide deployment, but those units do not match the combined-arms integration of a MAGTF and lack the logistics that the Navy provides. Therefore, the Marine Corps is often assigned to non-combat missions such as the evacuation of Americans from unstable countries and providing humanitarian relief during natural disasters. In larger conflicts, Marines act as a stopgap, to get into and hold an area until larger units can be mobilized. The Corps performed this role in World War I and the Korean War, where Marines were the first significant combat units deployed from the United States and held the line until the country could mobilize for war. To aid rapid deployment, the Maritime Pre-Positioning System was developed: fleets of container ships are positioned throughout the world with enough equipment and supplies for a Marine Expeditionary Force to deploy for 30 days. 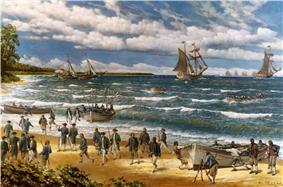 Continental Marines land at New Providence during the Battle of Nassau, the first amphibious landing of the Marine Corps. The United States Marine Corps traces its institutional roots to the Continental Marines of the American Revolutionary War, formed by Captain Samuel Nicholas by a resolution of the Second Continental Congress on 10 November 1775, to raise two battalions of Marines. That date is regarded and celebrated as the date of the Marine Corps' birthday. At the end of the American Revolution, both the Continental Navy and Continental Marines were disbanded in April 1783. The institution itself would not be resurrected until 11 July 1798. At that time, in preparation for the Quasi-War with France, Congress created the United States Marine Corps. Marines had been enlisted by the War Department as early as August 1797 for service in the new-build frigates authorized by the Congressional "Act to provide a Naval Armament" of 18 March 1794, which specified the numbers of Marines to be recruited for each frigate. 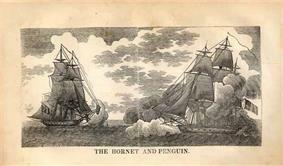 The battle between Hornet and Penguin, the final engagement between British and American forces during the War of 1812, which led to the capture and destruction of the British ship by Marine infantry troops. During the War of 1812, Marine naval detachments took part in the great frigate duels that characterized the war, which were the first and last engagements of the conflict. Their most significant contribution was holding the center of Gen. Andrew Jackson's defensive line at the Battle of New Orleans, the final major battle of the conflict. By the end of the war, most notably during the capture of HMS Cyane, Levant, and Penguin, the final engagements between British and American forces, the Marines had acquired a well-deserved reputation as expert marksmen, especially in ship-to-ship actions. After the war, the Marine Corps fell into a malaise that ended with the appointment of Department of the Navy as a sister service to the Navy. This would be the first of many times that the existence of the Corps was challenged. With their vast service in foreign engagements, the Marine Corps played a moderate role in the Fort Pulaski. The remainder of the 19th century was marked by declining strength and introspection about the mission of the Marine Corps. The Navy's transition from sail to steam put into question the need for Marines on naval ships. Meanwhile, Marines served as a convenient resource for interventions and landings to protect American lives and interests overseas. 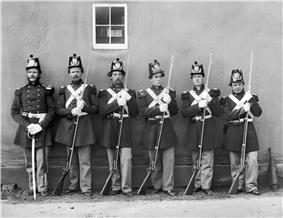 The Corps was involved in over 28 separate interventions in the 30 years from the end of the American Civil War to the end of 19th century. They would be called upon to stem political and labor unrest within the United States. 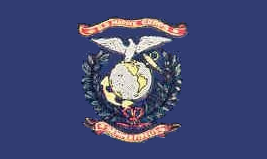 Under Commandant Jacob Zeilin's tenure, Marine customs and traditions took shape: the Corps adopted the Marine Corps emblem on 19 November 1868. It was during this time that "The Marines' Hymn" was first heard. 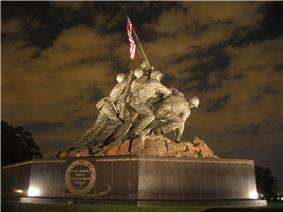 Around 1883, the Marines adopted their current motto "Semper Fidelis" (Always Faithful). John Philip Sousa, the musician and composer, enlisted as a Marine apprentice at the age of 13, serving from 1867 until 1872, and again from 1880 to 1892 as the leader of the Marine Band. During the Spanish–American War (1898), Marines led American forces ashore in the Philippines, Cuba, and Puerto Rico, demonstrating their readiness for deployment. At Guantánamo Bay, Cuba, the Marines seized an advanced naval base that remains in use today. Between 1899 and 1916, the Corps continued its record of vigorous participation in foreign expeditions, including the Philippine–American War, the Boxer Rebellion in China (1899–1901), Panama, the Cuban Pacifications, the Perdicaris Incident in Morocco, Veracruz, Santo Domingo, and the Banana Wars in Haiti and Nicaragua; the experiences gained in counter-insurgency and guerrilla operations during this period were consolidated into the Small Wars Manual. The flag of the U.S. Marine Corps from 1914 to 1939. During World War I veteran Marines served a central role in the late American entry into the conflict. The Marine Corps had a deep pool of officers and NCOs with battle experience, and experienced a small expansion. 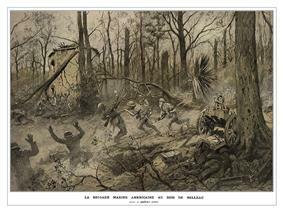 Here, the Marines fought their famed battle at Belleau Wood, creating the Marines' reputation in modern history. While its previous expeditionary experiences had not earned it much acclaim in the Western world, the Marines' ferocity and toughness in France earned them the respect of the Germans, who rated them of stormtrooper quality. 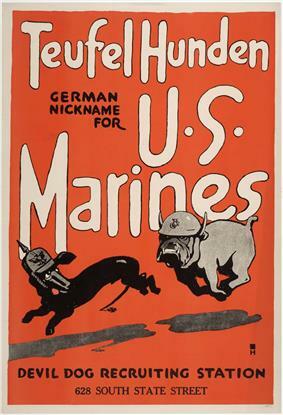 Though Marines and American media reported that Germans had nicknamed them Teufel Hunden as meaning "Devil Dogs", there is no evidence of this in German records (as Teufelshunde would be the proper German phrase). Nevertheless, the name stuck. The Corps entered the war with 511 officers and 13,214 enlisted personnel, and by 11 November 1918 had reached a strength of 2,400 officers and 70,000 enlisted. African-Americans were entirely excluded from the Marine Corps during this conflict. Opha May Johnson was the first woman to enlist in the Marines; she joined the Marine Corps Reserve in 1918 during World War I, officially becoming the first female Marine. From then until the end of World War I, 305 women enlisted in the Corps. Between the World Wars, the Marine Corps was headed by Commandant John A. Lejeune, and under his leadership, the Corps presciently studied and developed amphibious techniques that would be of great use in World War II. 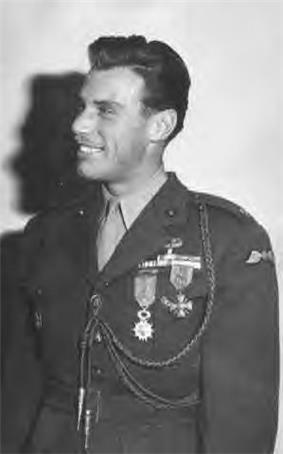 Many officers, including Lt. Col. Earl Hancock "Pete" Ellis, foresaw a war in the Pacific with Japan and undertook preparations for such a conflict. Through 1941, as the prospect of war grew, the Corps pushed urgently for joint amphibious exercises and acquired amphibious equipment that would prove of great use in the upcoming conflict. Former French Foreign Legion Lieutenant and United States Marine Corps officer Peter J. Ortiz. Color photo of the USMC War Memorial, a bronze statue of six men planting a flagpole with an American Flag into the ground. In World War II, the Marines played a central role in the Pacific War. The battles of Guadalcanal, Bougainville, Tarawa, Guam, Tinian, Cape Gloucester, Saipan, Peleliu, Iwo Jima, and Okinawa saw fierce fighting between Marines and the Imperial Japanese Army. The island of Iwo Jima served as the next area of battle, which began on 19 February 1945. The Japanese had learned from their defeats in the Marianas campaign and prepared many fortified positions on the island, including pillboxes and underground tunnels. The Japanese put up fierce resistance, but American forces reached the summit of Mount Suribachi on 23 February. The mission was accomplished at very high losses, with 26,000 American casualties and 22,000 Japanese. By the end of the war, the Corps expanded from two brigades to six divisions, five air wings, and supporting troops, totaling about 485,000 Marines. In addition, 20 defense battalions and a parachute battalion were set raised. Nearly 87,000 Marines were casualties during World War II (including nearly 20,000 killed), and 82 were awarded the Medal of Honor. Despite Secretary Forrestal's prediction, the Corps faced an immediate institutional crisis following the war due to the low budget. Army generals pushing for a strengthened and reorganized defense establishment attempted to fold the Marine mission and assets into the Navy and Army. Drawing on hastily assembled Congressional support, and with the assistance of the so-called "Revolt of the Admirals,"the Marine Corps rebuffed such efforts to dismantle the Corps, resulting in statutory protection of the Marine Corps in the National Security Act of 1947. Shortly afterward, in 1952 the Douglas–Mansfield Bill afforded the Commandant an equal voice with the Joint Chiefs of Staff on matters relating to the Marines and established the structure of three active divisions and air wings that remain today. F4U Corsairs provide close air support to Marines fighting Chinese forces, December 1950. The Korean War (1950–1953) saw the hastily formed Provisional Marine Brigade holding the defensive line at the Pusan Perimeter. To execute a flanking maneuver, General Douglas MacArthur called on Marine air and ground forces to make an amphibious landing at Inchon. The successful landing resulted in the collapse of North Korean lines and the pursuit of North Korean forces north near the Yalu River until the entrance of the People's Republic of China into the war. 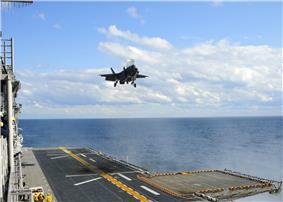 Chinese troops surrounded, surprised and overwhelmed the overextended and outnumbered American forces. X Corps, which included the 1st Marine Division and the Army's 7th Infantry Division, regrouped and inflicted heavy casualties during their fighting withdrawal to the coast, now known as the Battle of Chosin Reservoir. The fighting calmed after the Battle of the Chosin Reservoir, but late in March 1953 the relative quiet of the war was broken when the Chinese Army launched a massive offensive on three outposts manned by the 5th Marine Regiment. These outposts were codenamed "Reno", "Vegas", and "Carson". The campaign was collectively known as the Nevada Cities Campaign. There was brutal fighting on Reno hill, which was eventually captured by the Chinese. Although Reno was lost, the 5th Marines held both Vegas and Carson through the rest of the campaign. In this one campaign, the Marines suffered approximately 1,000 casualties, while the Chinese suffered at least twice as many. Marines would continue a battle of attrition around the 38th Parallel until the 1953 armistice. The Marine Corps served an important role in the Vietnam War taking part in such battles as Da Nang, Hue City, Con Thien and Khe Sanh. 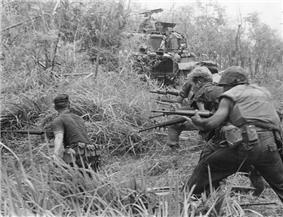 Individuals from the USMC operated in the Northern I Corps Regions of South Vietnam. While there, they were constantly engaged in a guerrilla war against the Viet Cong, along with an intermittent conventional war against the North Vietnamese Army (NVA). Portions of the Corps were responsible for the less-known Combined Action Program (CAP) that implemented unconventional techniques for counter-insurgency and worked as military advisers to the Republic of Vietnam Marine Corps. Marines were withdrawn in 1971, and returned briefly in 1975 to evacuate Saigon and attempt a rescue of the crew of the Mayagüez. During the Gulf War (1990–1991), Marine task forces formed the initial core for Operation Desert Shield, while United States and Coalition troops mobilized, and later liberated Kuwait in Operation Desert Storm. Marines participated in combat operations in Somalia (1992–1995) during Operations Restore Hope, Restore Hope II, and United Shield to provide humanitarian relief. In 1997, Marines took part in Operation Silver Wake, the evacuation of American citizens from the US Embassy in Tirana, Albania. Following the Global War on Terrorism. The stated objective of the Global War on Terror is "the defeat of Al-Qaeda, other terrorist groups and any nation that supports or harbors terrorists." Since then, the Marine Corps, alongside other military and federal agencies, has engaged in global operations around the world in support of that mission. In spring 2009, President Barack Obama's goal of reducing spending in the Defense Department was led by Secretary Robert Gates in a series of budget cuts which did not result in significant changes in the Corps' budget and programs, cutting only the VH-71 Kestrel and resetting the VXX program. However, the National Commission on Fiscal Responsibility and Reform singled the Corps out for the brunt of a series of recommended cuts in late 2010. In light of budget sequestration in 2013, commandant Amos set a goal of a force of 174,000 Marines. He testified that this was the minimum number that would allow for an effective response to even a single contingency operation, but it would reduce the peacetime ratio of time at home bases to time deployed down to a historical low level. Marines and other American forces began staging in Pakistan and Uzbekistan on the border of Afghanistan as early as October 2001 in preparation for Operation Enduring Freedom. The 15th and 26th Marine Expeditionary Units were the first conventional forces into Afghanistan in support of Operation Enduring Freedom in November 2001, and in December, the Marines seized Kandahar International Airport. Since then, Marine battalions and squadrons have been rotating through, engaging Taliban and Al-Qaeda forces. Marines of the 24th Marine Expeditionary Unit flooded into the Taliban-held town of Garmsir on 29 April 2008, in Helmand Province, in the first major American operation in the region in years. In June 2009, 7,000 Marines with the 2nd Marine Expeditionary Brigade deployed to Afghanistan in an effort to improve security, and began Operation Strike of the Sword the next month. In February 2010, the 2nd Marine Expeditionary Brigade launched the largest offensive of the Afghan Campaign since 2001, the Battle of Marjah, to clear the Taliban from their key stronghold in the Helmand Province. After Marjah, Marines progressed north up the Helmand River and cleared the towns of Kajahki and Sangin. Marines remained in the Helmand Province until 2014. 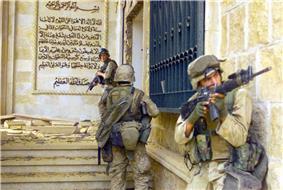 U.S. Marines during the Second Battle of Fallujah in November 2004. The U.S. Marines served prominently in the Iraq War's Operation Iraqi Freedom. The I Marine Expeditionary Force, along with the U.S. Army's 3rd Infantry Division, spearheaded the 2003 invasion of Iraq. 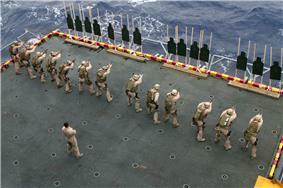 The Marines left Iraq in the summer of 2003, but returned for occupation duty in the beginning of 2004. They were given responsibility for the Al Anbar Province, the large desert region to the west of Baghdad. 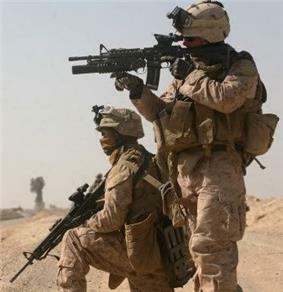 During this occupation, the Marines spearheaded both assaults on the city of Fallujah in April (Operation Vigilant Resolve) and November 2004 (Operation Phantom Fury) and saw intense fighting in such places as Ramadi, Al-Qa'im and Hīt. Their time in Iraq has courted controversy with the Haditha killings and the Hamdania incident. The Anbar Awakening and 2007 surge reduced levels of violence. On 1 March 2009, at Camp Lejeune, President Obama announced an accelerated withdrawal, promising all troops out by August 2010. The Marine Corps officially ended its role in Iraq on 23 January 2010 when they handed over responsibility for Al Anbar Province to the United States Army. 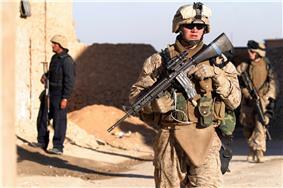 US Marines would ultimately return to Iraq in the summer of 2014, in response to growing violence there. Throughout the Global War on Terrorism, the US Marines have supported operations in Africa to counter Islamic extremism and piracy in the Red Sea. In late 2002, Combined Joint Task Force – Horn of Africa was stood up at Camp Lemonnier, Djibouti to provide regional security. Despite transferring overall command to the Navy in 2006, the Marines continued to operate in the Horn of Africa into 2007. 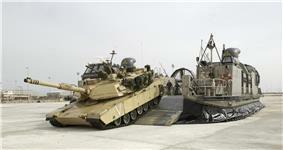 See Operation Enduring Freedom- Horn of Africa. The Headquarters (HQMC), the Operating Forces, the Supporting Establishment, and the Reserve (MARFORRES or USMCR). The Operating Forces are divided into three categories: Marine Corps Forces (MARFOR) assigned to unified commands, Security Forces guarding high-risk naval installations, and Security Guard detachments at American embassies. Under the "Forces for Unified Commands" memo, in accordance with the Unified Command Plan approved by the President, Marine Corps Forces are assigned to each of the Combatant Commands at the discretion of the Secretary of Defense. Since 1991, the Marine Corps has maintained component headquarters at each of the regional unified combatant commands. Marine Corps Forces are divided into Forces Command (MARFORCOM) and Pacific Command (MARFORPAC), each headed by a Lieutenant General. MARFORCOM has operational control of the II Marine Expeditionary Force; MARFORPAC has operational control of the I Marine Expeditionary Force and III Marine Expeditionary Force. The Supporting Establishment includes the Combat Development Command (MCCDC), the Logistics Command, the Recruiting Command and its depots, administration of Marine bases and air stations, and the Marine Band. In general, the Marine Corps shares many resources with the other branches of the United States military. However, the Corps has consistently sought to maintain its own identity with regards to mission, funding, and assets, while utilizing the support available from the larger branches. While the Marine Corps has far fewer installations both in the U.S. and worldwide than the other branches, many Army posts, Naval stations, and Air Force bases have a Marine presence. They also cross train with other countries. ^ The United States Coast Guard is smaller, about one-fifth the size of the U.S. Marine Corps, but it is part of United States Department of Homeland Security and does not normally operate under the DoD except during times of war and directed by the U.S. president. 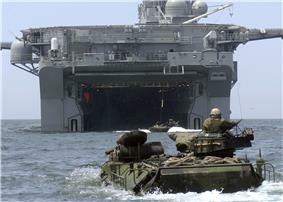 However, it is the largest maritime force in the world, and is larger than the armed forces of many significant military powers; for example, the USMC is larger than the active duty Israel Defense Forces. ^ "Marine Corps Expeditionary Energy Office.". Marines.mil. ^ Contains a very detailed account of almost all the actions of the Continental Marines and USMC until 1932. It is available in scanned TIFF format from the archives of the Marine Corps University. 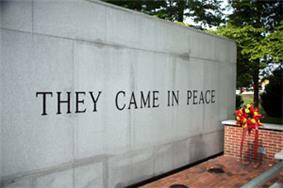 ^ Official Navy figures number the Marine deaths at 13,091. This source provides a number of 14,837. ^ a b 13-Ammunition and Explosives – M6785412I1003 (Archived) – Federal Business Opportunities: Opportunities. Fbo.gov (9 November 2011). The basic infantry weapon of the Marine Corps is the M16 assault rifle family, with a majority of Marines being equipped with the M16A2 or M16A4 service rifles (the M16A2 is being phased out). The M4 carbine and Colt 9mm SMG have also been issued. The standard side arm is the M9A1 pistol. The Colt M1911A1 is also being put back into service as the M45A1 Close Quarter Battle Pistol (CQBP) in small numbers. 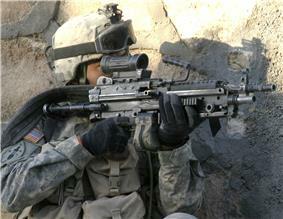 Suppressive fire is provided by the M249 SAW (currently transitioning to the M27 IAR) and M240 machine guns, at the squad and company levels respectively. In addition, indirect fire is provided by the M203 grenade launcher and the M32 grenade launcher in fireteams, M224 60 mm mortar in companies, and M252 81 mm mortar in battalions. The M2 .50 caliber heavy machine gun and MK19 automatic grenade launcher (40 mm) are available for use by dismounted infantry, though they are more commonly vehicle-mounted. "Ex-Marine" is used in reference to persons removed from the Corps with less than a full and honorable discharge, especially those dishonorably discharged. Persons wishing to avoid this issue address these individuals by name with no reference to the Corps. "Former Marine" or "Veteran Marine" is acceptable in referring to anyone who has been honorably discharged from the Corps. Devil Dog has several oft-disputed explanations, but the tradition has expanded to include the English bulldog's association with the Corps, especially as a mascot. The Utility Uniform, currently the Marine Corps Combat Utility Uniform, is a camouflage uniform intended for wear in the field or for dirty work in garrison, though it has now been standardized for regular duty. It is rendered in a distinctive MARPAT pixelated camouflage (sometimes referred to as digitals or digies) that breaks up the wearer's shape, and serves to distinguish Marine uniforms from those of other services. In garrison, the woodland uniform is worn in winter, and the desert uniform is worn in summer. 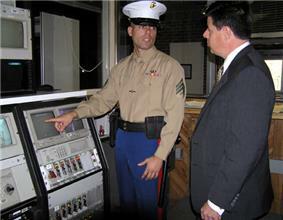 Marines consider the utilities a working uniform and do not permit their wear off-base, except in transit to and from their place of duty and in the event of an emergency. This, too, distinguishes them from other services, which have less stringent restrictions. 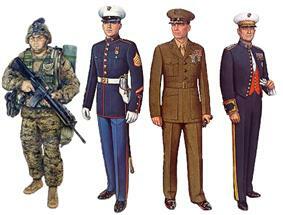 Marines have three main uniforms: Dress, Service, and Utility. The Marine Corps Dress uniform is the most elaborate, worn for formal or ceremonial occasions. There are three different forms of the Dress uniform, the most common being the Blue Dress Uniform, called "Dress Blues" or simply "Blues". It is most often seen in recruiting advertisements and is equivalent to black tie. There is a "Blue-White" Dress for summer, and Evening Dress for formal (white tie) occasions. Versions with a khaki shirt in lieu of the coat (Blue Dress Charlie/Delta) are worn as a daily working uniform by Marine recruiters and NROTC staff. 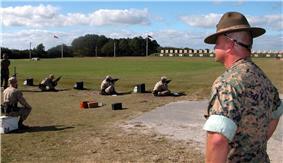 Enlisted Marines attend recruit training, known as boot camp, at either Marine Corps Recruit Depot San Diego or Marine Corps Recruit Depot Parris Island. Historically, the Mississippi River served as the dividing line which delineated who would be trained where, while more recently, a district system has ensured a more even distribution of male recruits between the two MCRD facilities. Females attend only the Parris Island depot as part of the segregated Fourth Recruit Training Battalion. All recruits must pass a fitness test to start training; those who fail receive individualized attention and training until the minimum standards are reached. 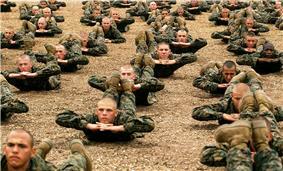 Marine recruit training is the longest among the American military services; it is 12 weeks long, compared to the Army's 10 weeks and the Navy's 9 weeks. 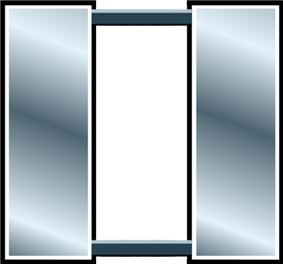 The E-8 and E-9 levels each have two and three ranks per pay grade, respectively, each with different responsibilities. The First Sergeant and Sergeant Major ranks are command-oriented, serving as the senior enlisted Marines in a unit, charged to assist the commanding officer in matters of discipline, administration and the morale and welfare of the unit. Master Sergeants and Master Gunnery Sergeants provide technical leadership as occupational specialists in their specific MOS. The Sergeant Major of the Marine Corps also E-9, is a billet conferred on the senior enlisted Marine of the entire Marine Corps, personally selected by the Commandant. It is possible however for an enlisted Marine to hold a position senior to Sergeant Major of the Marine Corps as has been the case since the 2011 appointment of Sergeant Major Bryan B. Battaglia to the billet of Senior Enlisted Advisor to the Chairman which is deemed the senior enlisted member of the United States military. Enlisted Marines in the pay grades E-1 to E-3 make up the bulk of the Corps' ranks, usually referred to simply as "Marines". Although they do not technically hold leadership ranks, the Corps' ethos stresses leadership among all Marines, and junior Marines are often assigned responsibility normally reserved for superiors. Those in the pay grades of E-4 and E-5 are non-commissioned officers (NCOs). They primarily supervise junior Marines and act as a vital link with the higher command structure, ensuring that orders are carried out correctly. Marines E-6 and higher are Staff Non-Commissioned Officers (SNCOs), charged with supervising NCOs and acting as enlisted advisers to the command. 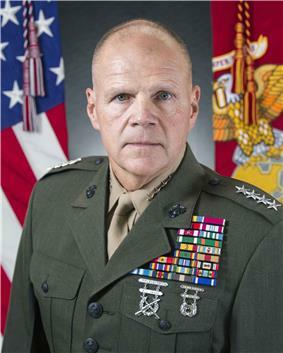 The current and 37th Commandant is Robert Neller, who assumed the position on 30 September 2015. The 33rd and current Assistant Commandant is John M. Paxton, Jr., while the 18th and current Sergeant Major is Ronald L. Green. 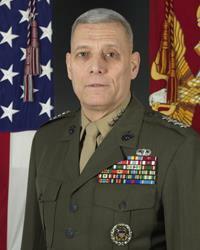 Other Marine generals may be senior to the Commandant or Assistant Commandant in terms of time in grade and/or billet. The Assistant Commandant of the Marine Corps acts as a deputy to the Commandant. The Sergeant Major of the Marine Corps is the senior enlisted Marine, and acts as an adviser to the Commandant. Headquarters Marine Corps comprises the rest of the Commandant's counsel and staff, with deputy Commandants that oversee various aspects of the Corps assets and capabilities. Other important bases include air stations, recruit depots, logistics bases, and training commands. Marine Corps Air Ground Combat Center Twentynine Palms in California is the Marine Corps' largest base and home to the Corps' most complex, combined-arms, live-fire training. Marine Corps Base Quantico in Virginia is home to Marine Corps Combat Development Command, and nicknamed the "Crossroads of the Marine Corps". Marines operate detachments at many installations owned by other branches, to better share resources, such as specialty schools. 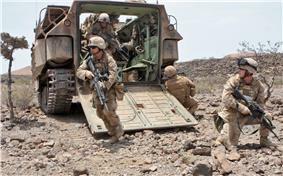 Marines are also present at, and operate many, forward bases during expeditionary operations. Finally, Marines operate a presence in the National Capital Region, with Headquarters Marine Corps scattered amongst the Pentagon, Henderson Hall, Washington Navy Yard, and Marine Barracks, Washington, D.C. 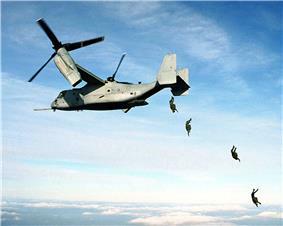 The Marine Corps accounts for around six percent of the military budget of the United States. The cost per Marine is $20,000 less than the cost of a serviceman from the other services, and the entire force can be used for both hybrid and major combat operations, enabling it to carry out full scale military action, peacekeeping operations and humanitarian aid – the entire Three Block War. Note that these per capita costs do not account for support provided by the Navy and other branches, such as the Navy's amphibious warfare ships and long-range air transport by the USAF. However given expected defense budget cuts, the Marines are well positioned for "fielding cheap options for an uncertain world." The Marine Corps budget is comparably well handled with a tiny fraction of the Anti-Deficiency Act violations of any of the other three major branches. In 2013, the USMC became the first American military branch to ever have a fully audited annual budget. Although the notion of a Marine special forces contribution to the United States Special Operations Command (USSOCOM) was considered as early as the founding of USSOCOM in the 1980s, it was resisted by the Marine Corps. Then-Commandant Paul X. Kelley expressed the popular belief that Marines should support Marines, and that the Corps should not fund a special operations capability that would not support Marine operations. However, much of the resistance from within the Corps dissipated when Marine leaders watched the Corps' 15th and 26th MEU(SOC)s "sit on the sidelines" during the very early stages of Operation Enduring Freedom while other special operations units actively engaged in operations in Afghanistan. After a three-year development period, the Corps agreed in 2006 to supply a 2,500-strong unit, Marine Forces Special Operations Command (MARSOC), which would answer directly to USSOCOM. 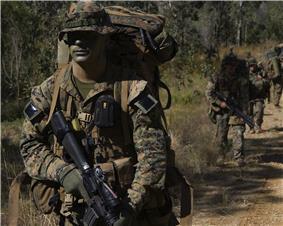 Marine special operators conduct CQB training. 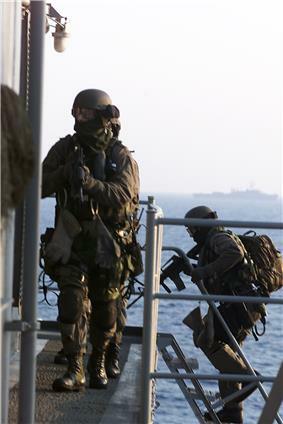 A team of Marine Force Recon operators training during a Maritime Interdiction Operation (MIO) exercise-example of black operations. While the majority of Marine aviation assets ultimately derive from the Navy, some support is drawn from the United States Air Force. 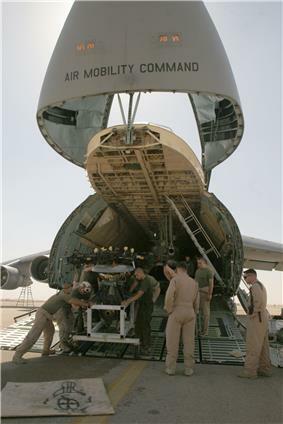 The Marine Corps makes extensive use of the USAF Air Mobility Command to airlift Marines and equipment. Marine and sailor train with rifles in Djibouti. Culturally, Marines and soldiers share most of the common U.S. military slang and terminology, but the Corps utilizes a large number of naval terms and traditions incompatible with the Army lifestyle, as well as their own unique vernacular. Many Marines regard their culture to have a deep warrior tradition, with the ethos that "Every Marine a rifleman" and emphasis on cross-training and combat readiness despite actual job, be it infantry or otherwise. One source states Marines tend to decentralize and push leadership to lower levels, while fostering initiative to a greater degree. Doctrinally, the Marine Corps' focus is on being expeditionary and independent, and places emphasis on amphibious mobility and MAGTF. 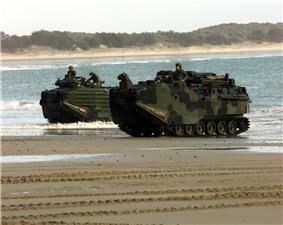 Marines operate as expeditionary units and are completely amphibious. The Marine Corps focus on standardized infantry units with the other arms in support roles as the "Every Marine a rifleman" creed shows. This commitment to standardized units can be seen in the short-lived experiment of the Marine Raiders, born in World War II, was controversial. While the U.S. Army's 75th Ranger Regiment, also born in World War II, enjoys high prestige to this day. The Army has a longer continuous tradition of special operations forces; the Marines joined the Special Operations Command with the establishment of MCSOCOM Detachment One in 2003.